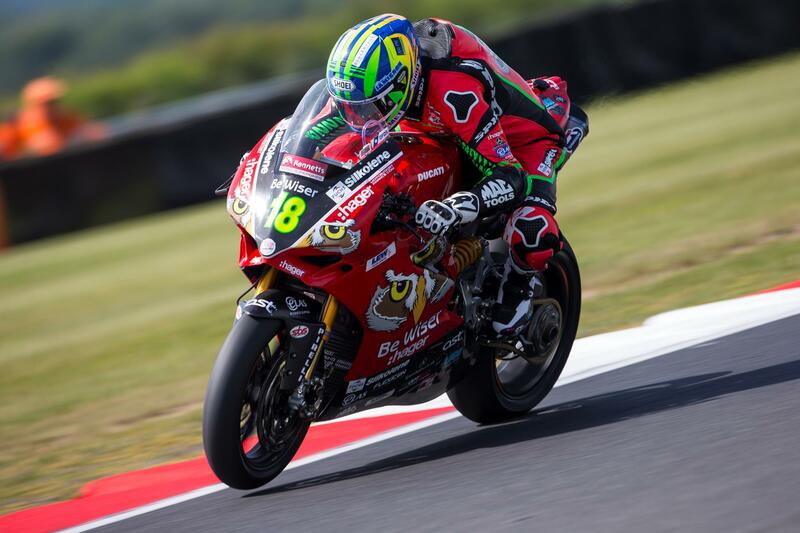 Rookie Andrew Irwin impressed on his first day with Be Wiser Ducati as he makes his Bennetts British Superbike debut at Snetterton this weekend. The 2017 British Supersport runner-up has been drafted in to the PBM squad in place of the injured Shane Byrne, but faces a steep learning curve having never ridden a superbike before. Despite that, Irwin enjoyed a strong opening day on the bike, placing 16th quickest in the first session just 1.7 seconds off his brother who led the way before improving his time by 1.5 seconds in FP2 to place seventh. “Coming in to the weekend I had no expectations and was thinking if I can get a point I’d be happy… that still is the goal as a race is different to a single lap but it’s nice to be inside the top ten,” Irwin told MCN after the session. “I improved straight away with the old tyre this morning and that gave me a bit of belief. The team have been so good, they’re telling me exactly what I need to do to adapt to riding a superbike and that’s making my job ten times easier. I’ve got the best bike and the best team around me and that’s great. “Knockhill was the first time I’d ridden a superbike, that was a bit of a shock but coming here has been nice as it’s much more natural and you’re not on the rear brake all the time. It’s actually really enjoyable to ride. Some people told me that when you start riding a Superbike you miss the 600s but I’m loving it so far. This is something I never thought would happen, so I don’t know what to say!